You are here: Home / Blog / KetoWeightLoss.com Supplement Review: SCAM Warning! If I were you, I would keep my distance from the newest keto supplement in town weirdly branded KetoWeightLoss.com. As at the time of writing this review, the owners of this supplement are aggressively running multiple, expensive Facebook ads to push their supplement … and they are basically targeting everybody, no matter which country you’re in. So pay attention to this important review because it is one of, or if not the first honest review about this product currently existing at this time. So let’s begin, shall we? Now that’s a problematic claim I’ll address later but first, let’s talk more about this supplement. The owners further claim that their suplement has already helped ‘over 185,000 happy customers’ lose weight. According to them, Keto Weight Loss’ ‘unique formula’ is ‘100% organic’, ‘vegetarian’, ‘gluten-free’, ‘GMO free’, ‘soy free’ and ‘dairy free.’ It is also supposedly suitable for everyone, whether you are a normal, everyday person or an athlete. 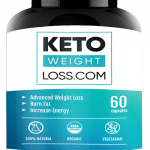 On their website, we are told that Keto Weight Loss is a system that ‘that merges the synergistic power of 3 natural, plant‐based supplements. ‘ But then they never tell us the names of these 3, natural, plant-based supplements. Instead, in the ingredients section of the website, we are told that Keto Weight Loss contains Beta-Hydroxybutyric acid (BHB), which is the main ketone byproduct of fat metabolism that the body uses for energy. Just as I talked about in my HVMN Ketone review, BHB is naturally produced by the body when it is in the state of ketosis (burning fat for energy). But Keto Weight Loss claims that, by using their supplement, you can bypass this natural step and still reap the benefits. Interesting. Let’s talk more about it below. As for which diet to follow while using Keto Weight Loss, the manufacturer basically says that it doesn’t really matter, as using their supplement will ‘quickly and easily’ put you in a state of ketosis anyway. However, we’re later told that combining the supplement with a ketogenic diet plan will give you the best results. One bottle of Keto Weight Loss, the equivalent of a one-month supply, costs $49.95. Other plans include a 3-month supply (‘Buy two, get one free’ LOL) that will cost you $75 total even though a bottle in that plan costs $25. So much for the ‘free’ bottle bonus. The same funny pricing tactic is seen in their most expensive (and default) pricing plan: A 5-month supply (‘Buy three, get 2 free’ LOL) that will cost you a total of $98 even though a bottle at that plan costs just $19.60. For those of you who do not understand what’s going on, here is the simple explanation. The Keto Weight Loss owners are trying to give you the impression that you are getting a sweet deal (free bottles + discount) if you purchase their more expensive plans while actually, you are paying for the whole thing. For example, the price of one bottle in the 3 month plan costs $25. From the screenshot above, you can see that you’ll be paying for two bottles and getting one free. This means that you should be paying $50 instead of the $75 listed. See? You are paying for the ‘free’ bottle! Anyway, Keto Weight Loss comes with a 90-day money back guarantee. So if you are not satisfied with the product, you can ask for your money back by calling them on one of their listed phone numbers. In my experience though, don’t keep your hopes up that they’ll indeed honor their refund policy. Keto Weight Loss and Charity ‘Vitamin Angels’: Don’t Fall For It! Keto Weight Loss claims that each order you place on their website will make them donate a 6-month supply of ‘essential vitamins’ to ‘a child with malnutrition’ using a charity called ‘Vitamin Angels.’ Well judging from their dishonest pricing plan above, I don’t have any reason to believe that they will ever fulfill this promise. As far as I’m concerned, this is another marketing tactic designed to tug at your emotions and make you believe that you’ll be lending a helping hand to suffering children. This is all designed to make it easier for you to part with your money! So my advice is this. If you want to help these malnourished kids with vitamins, don’t do it through buying Keto Weight Loss. Instead, go directly to Vitamin Angels’ website and donate there. It’s as Simple as that! We wanted to find a simple solution to help reach Ketosis and we found a simple way to do so! Whatever your lifestyle may be, KETO can easily be a part of it. We believe in healthy living, including a balanced diet and an active lifestyle. Whether your new to the Ketogenic diet or not, our team is here to help you reach your goals! That’s literally it. No information about their CEO or qualifications of the people they employed to manufacture this product. In fact, they weren’t even bold enough to display their company name on the main page, instead, they hid it in their Terms and Conditions page. And of course, they hid their website domain information from the public so we cannot know who registered it. Anyway, according to their Terms and Conditions page, Keto Weight Loss is owned by KWL Wellness Inc., a company based in Canada, US and India. My investigation revealed that this company is actually registered in Canada. But if you look at the website, you’ll notice that the India presence of this company is not disclosed on the main page, but hidden away in the Terms and Conditions page. Now why is that? Something is fishy here, don’t you think? Over at the the Terms and Conditions page, we are told that their return shipping address is in one village in India. Again, not kidding. Here is a screenshot. Wait a minute. Didn’t they tell us that Keto Weight Loss is ‘made in the USA’? How come that if you want to get your money back, you have to send back your product to them in India and not USA? Again, the Terms and Conditions also state that by buying their product, you ‘waive’ your right to file a class action lawsuit or bring any case against them before a grand jury. And finally, we’re told that the ‘minimum’ advertised price set by the KWL Inc for their product is $54.95. But if look at the pricing screenshot I took above, you’ll see that this isn’t true. Yet another example of inconsistency and/or dishonesty with pricing. Personally, I will never do business with any company with this kind of pricing inconsistencies! Like I mentioned earlier, the company behind Keto Weight Loss says that taking their supplement alone is enough to put your body into ‘ketosis.’ According to them, their product works regardless of the diet you’re currently on. Basically, you can eat all the carbs you want and as far as you’re popping two capsules of Keto Weight Loss every morning with lemon water, you’ll ‘quickly and easily’ enter the state of ketosis. Well if that’s the case, then this company has proven beyond any reasonable doubt that they know absolutely nothing about how ketosis is achieved. 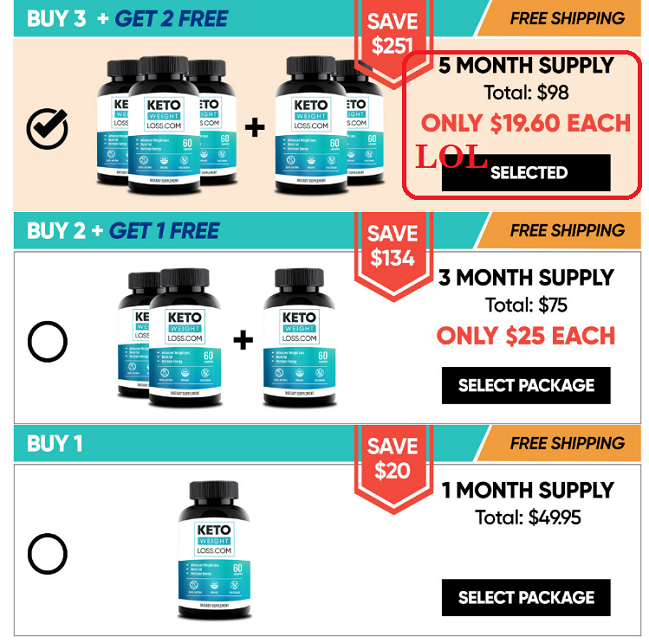 It is the same mistake keto supplement sellers like this make all the time – they claim that all you need to do to achieve ketosis is to take their supplement and when your blood or urine ketone level rises, then you’re officially in ketosis. This is outright false … and you should avoid any keto supplement that makes this claim at all costs! For the umpteenth time, ketosis only occurs when your body is deprived of glucose and its reserve (glycogen). At this state, the body enters starvation mode, resorting to burning fat and protein instead for energy. This state can only be achieved through diet, nothing else! The website of Keto Weight Loss features three faceless testimonials that we obviously can’t trust. However, things get interesting when you visit the supplement’s Facebook page. There you’ll see that people are not happy with the product. I spent hours searching through the thousands of comments left on the page, and I couldn’t see a single positive testimonial. One thing that also caught my attention is that the page admins of Keto Weight Loss disabled the review feature Facebook now has for pages. This means that people won’t be able to leave reviews of the product. I believe that this was done on purpose because the Keto Weight Loss guys can’t afford to have bad reviews on their own page since they know for a fact that reviews left on Facebook pages can’t be deleted by the admins. If they are really confident about their product, then why didn’t they leave the review section active? Final Conclusion: DON’T BUY KetoWeightLoss.com Supplement. SCAM WARNING! If you have made the mistake of buying this product, the best thing to do is to file a credit card dispute with your bank. I don’t see them honoring their refund guarantee. But hey, you are welcome to try asking them directly for your money back. 1. Thin From Within (Truth About Keto). This is a program by well-known nutritionist and fitness expert Brad Pilon. He designed this program specifically for women whose metabolism and/or body function has been wrecked by the harsh regimen of keto. It is also suitable for any female seeking to lose weight. Pilon assures that with this program, you will lose weight seamlessly and pleasantly without having to experience the side effects that normally accompany keto. Get the program now or read my review for more details. This is another weight loss program by Brad Pilon. It is a very famous program that has stood the test of time. Eat Stop Eat is all about how to lose weight and gain muscle by doing the correct form of intermittent fasting. One thing I like about this program is that there is no diet restrictions. You get to eat whatever you want on non-fasting days. Get the program now or read my review for more details. This program by certified nutritionist Janet Hadvill is designed for men and women over 40 who are struggling with losing belly (stress) fat. This program is all about simple dieting and exercise is NOT required. Get the program now or read my review for more details. Now unlike KetoWeightLoss.com supplement, these programs are cheaper and proven to work. On top of that, they will honor your refund request. That’s a guarantee. So don’t be afraid of trying them. They are not the only weight loss options though. Check out my Whitelist for even more legit weight loss programs. If you have used Keto Weight Loss supplement or have any contribution to make, feel free to use the comments section below. Thank you! Yes I figured it out later on…the discount figures made sense after you add up the 1-bottle package figures. I’ll remove that part from the review…but the ‘buy two, get 1 free’ et al part is still correct.